As we were driving to Waldport today, we saw the elk herd grazing in the field. I got so excited when I saw 2 little brown spots next to the big brown elk shapes in the distance! Could it be babies?!! 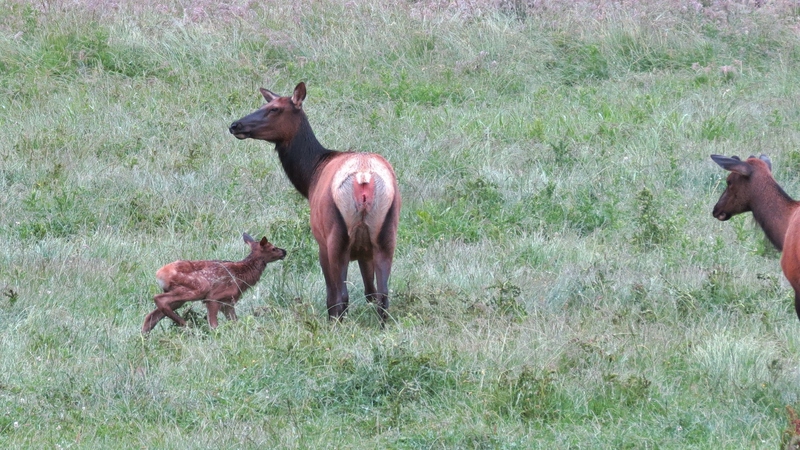 I didn’t know, until recently that elk calves had spots. This one was still a little wobbly and couldn’t keep up with Mom and the others. So it hunkered down and sunk deep into the tall grass. Then Mom came back for her. She got back up and Mom started walking away. 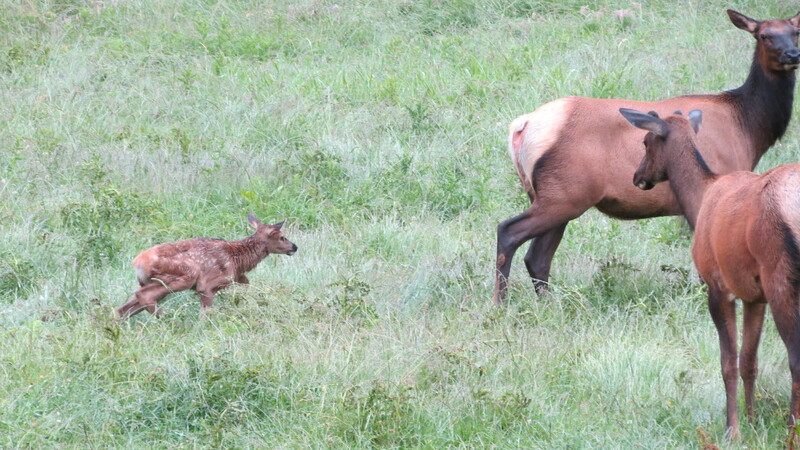 The calf followed and called after her in the quieter, squeakier, version of the elk call. 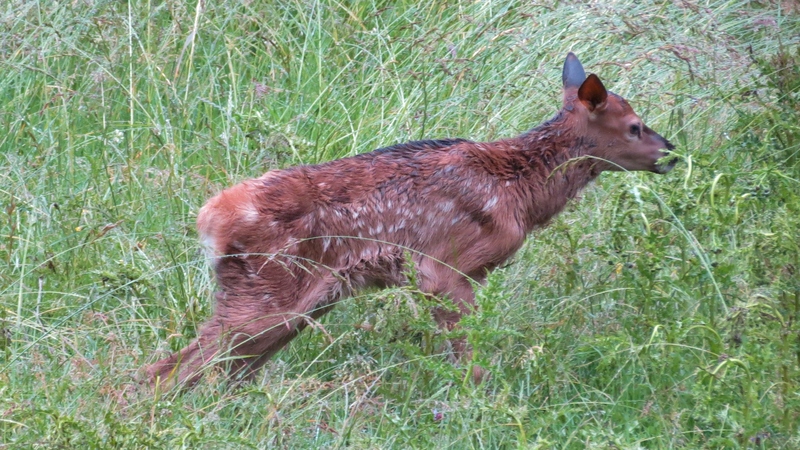 It rained last night and was still raining a little this morning when we saw them. So I’m not sure if this baby is wet from the rain or from being born. The other calf looked drier than this one. You can see the antlers just starting to grow on the yearling in the foreground. He looks curious about this tiny little thing squeaking as she walks. Oh the wonder of life! Of course we didn’t have time to stay and watch for long! Argh! I didn’t mind being 2 minutes late for my hair appointment but I’d already rescheduled 3 times and I’d probably lose my stylist if I did it again. This is the other one born on the same day. 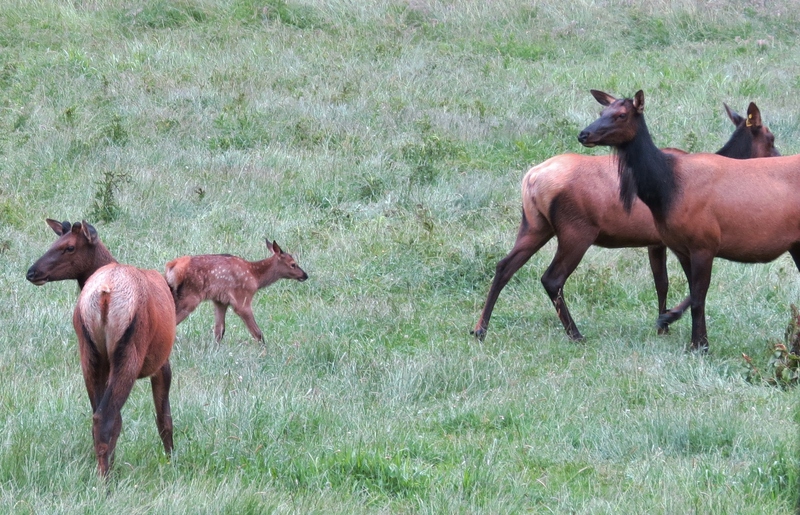 The calf was following Alllie (tagged cow elk A-3) across the field but we think the one looking at the calf is the mother. When we came back, an hour later, the elk were still in the field but not one sign of those little calves. I am sure they are somewhere, very near, in the tall grass though. In fact I drove by another couple times today (not to check on them – although I’m not above that) and they were still invisible. I’ll probably go back this evening to check on them. If we hadn’t come along at just the right moment, we might have never seen them! 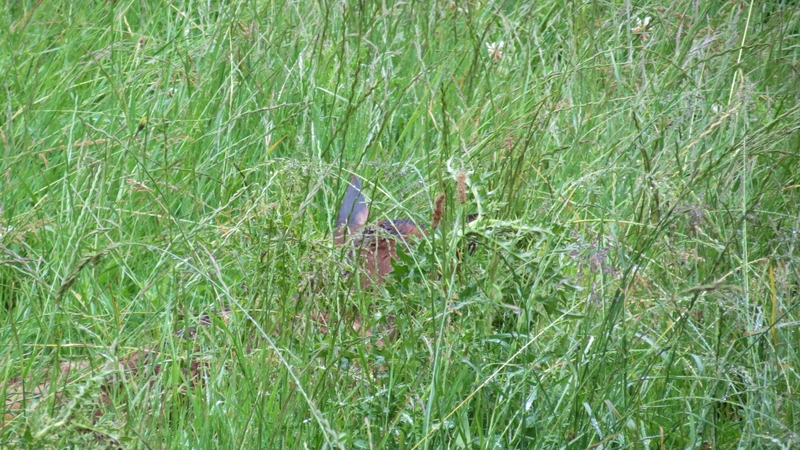 I read here that does leave their fawns hidden in the tall grass during the day and nurse them at night. Maybe elk do the same thing. Love baby animals – great captures!